THERE I was, just minding my own business, whilst in the process of encouraging the local mole population to vacate the farm, when I heard a sound that rapidly whisked me back to the summer of 1976. That’s almost 39 years ago, but nevertheless it immediately stopped me in my tracks. I looked up, as I have done so many times previously, straining my eyes across the vivid blue sky in order to find the source of that sound. After a few minutes of scanning the skies above me, slowly taking my gaze higher and higher, I found what I was looking for, hovering directly above my head was a solitary skylark. 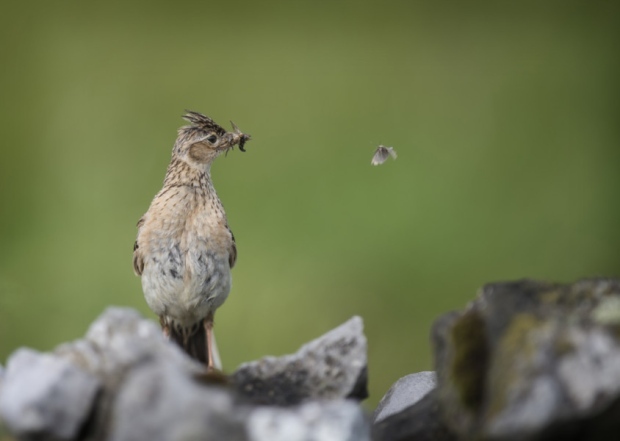 It was in the summer of ’76 that I first laid on my back in the middle of a field and watched in admiration as a skylark rose further and further above me up towards the heavens, all the while giving itself away with its distinctive song. The unfortunate thing is that it also brings back the other memories surrounding this incident. Our sheep flock has increased by a further two since last week making three new lambs in total so far. The second birth was easier than last weeks’ but none the less traumatic. After giving birth to her ram lamb and after several hours the ewe still wasn’t bonding with the lamb and he hadn’t managed to begin feeding. That’s when we intervened. Once again, out came the phone and onto the internet we went. After some hasty research, we made a plan. I held the mother, and lined up the teat and Wendy, my able assistant, directed the new lamb to make contact and latch on. Wendy then turned the ewe’s head so she could sniff her lambs back end and commence the bonding process. It worked like a dream and before long the ewe was licking her lamb clean as he continued to feed. We continued checking the sheep every couple hours or so throughout the day and night, but the third birth happened before I was even out of my bed. I was a little upset that we had missed the birth but thankfully everything had gone well and the lamb was up on his feet and feeding well. We will see what the next week has in store for us as we patiently await the arrival of our remaining lambs. Finally, this week I was reminded how unimportant things can become very annoying. Over the last year our hose pipe has more than tripled in length in order to reach various water feeders around the farm. One of the problems with joining hoses together is that they can pull apart far too easily, normally when turning sharp corners. The result being that Yours Truly usually gets a soaking whilst trying to fix it.